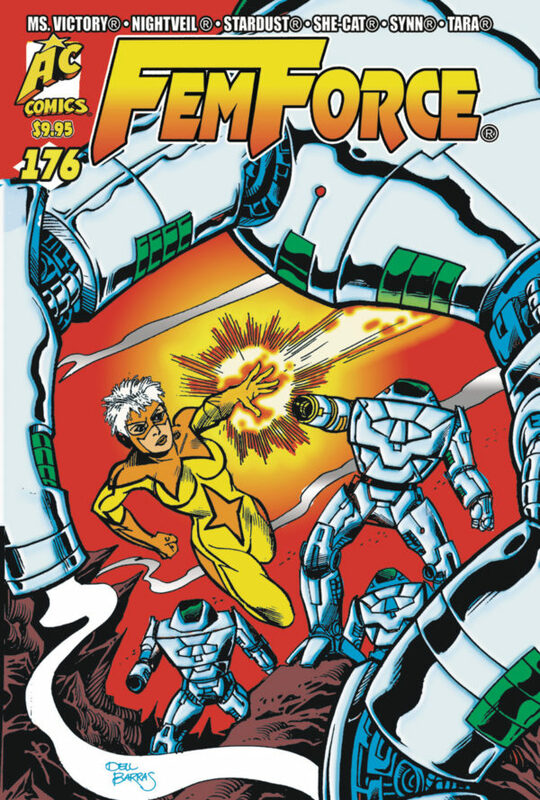 Not even Hurricane Matthew could stop it- FEMFORCE #176 is finally available!! The funeral of RIO RITA in Brazil segueways into a new mystery at home as an old friend is menaced by an even OLDER enemy in “Alive, But I’m Dead”, written by Mark and Stephanie Heike, with art by the Heikes and Jeff Austin. This opening stanza of this issue wraps up a number of old FF plotines and starts some new ones. Next, the ongoing tale of NIGHTVEIL on Dark Dhagor starts to gather speed as the plot she and mentor Azagoth have concocted to free the planet from the control of an evil sorceress goes into action, with NV challenging VIVARNA on her own home ground, in “Time Of The Season”, scripted by Mark Heike, with art by Dan Gorman and Jeff Austin. Then, writer Andrew Hawnt and artist Scott Shriver present a solo story starring STARDUST as Mara returns to her job at NASA only to be confronted by a new threat- KALIS- in “Where Vengeance Hides”. Then, art star Scott Shriver and writer Mark Holmes team up on a BLUE BULLETEER story set in 1947 as spies and pin-up girls get tangled in a web of espionage threatening a new atomic plant in “Sharpshooter”. That girl vigilante of the Old West, BLACK PHANTOM goes on the trail against a homicidal repeat-widow in “‘Till Death Do Us Part”, written by that man again, Mark Holmes; pencils by a new old friend, Dave Matsuoka, and inked by Bossman Bill Black!! The plotline from “where Vengeance Hides” is picked up in a second STARDUST story, “The Distant Horde”. Dusty and Ms. VICTORY are pulled into a pocket dimension where they must fight for their lives against KALIS and her mistress- TRAXIS; the villainess last seen in FF #172. Story by Andrew Hawnt with pencils by Rock Baker and inks by Bill Black. Next, SHE-CAT must decide who is worse, a new streetfighting vigilante or a slumlord gangster in “Beware The Violet Shadow”, written by Andrew “Three Stories” Hawnt with art by the dynamic Jacob Bear. Finally, DINOSAUR GIRL returns in her first Post-WWII adventure as she must team up with one old ally to defeat another in “Red Heat”, written and drawn by Rock Baker, with inks by Michael Bowers. FEMFORCE #178- It’s eighty full-pages of all new, never-before-seen stories of “good girl” art action and adventure. Full color covers with black and white interiors, saddle-stitched and standard comic book size, at 9.95. Released from AC Comics in October, 2016. The FF call in Firebeam to search for the spirit of Roberta Strock’s dead fiancé – with surprising results! A trip to the beach presages an undersea invasion, Ms. Victory challenges a new offworld threat, Stardust faces disaster and betrayal in the distant past, and Nightveil’s fight on Dhagor climaxes.